In this issue of Molecular Pharmacology, Tränkle et al. (p. 1597) present new findings regarding the existence of a second allosteric site on the M2 muscarinic acetylcholine receptor (M2 mAChR). The M2 mAChR is a prototypic class A G protein-coupled receptor (GPCR) that has proven to be a very useful model system to study the molecular mechanisms involved in the binding of allosteric GPCR ligands. Previous studies have identified several allosteric muscarinic ligands, including the acetylcholinesterase inhibitor tacrine and the bis-pyridinium derivative 4,4′-bis-[(2,6-dichloro-benzyloxy-imino)-methyl]-1,1′-propane-1,3-diyl-bis-pyridinium dibromide (Duo3), which, in contrast to conventional allosteric muscarinic ligands, display concentration-effect curves with slope factors >1. By analyzing the interactions of tacrine and Duo3 with other allosteric muscarinic agents predicted to bind to the previously identified `common' allosteric binding site, Tränkle et al. provide evidence suggesting that two allosteric agents and one orthosteric ligand may be able to bind to the M2 mAChR simultaneously. Moreover, studies with mutant mAChRs indicated that the M2 receptor epitopes involved in the binding of tacrine and Duo3 may not be identical. Molecular modeling and ligand docking studies suggested that the additional allosteric site probably represents a subdomain of the receptor's allosteric binding cleft. Because allosteric binding sites have been found on many other GPCRs and drugs interacting with these sites are thought to have great therapeutic potential, the study by Tränkle et al. should be of considerable general interest. The human genome is predicted to code for ∼1000 molecularly distinct G protein-coupled receptors (GPCRs) (Takeda et al., 2002; Fredriksson et al., 2003). GPCRs therefore represent one of the largest protein families found in nature. An extraordinarily large number of drugs in current clinical use exert their therapeutic effects via binding to specific GPCR subtypes, underscoring the great clinical importance of this class of receptors. Most of these drugs stimulate or inhibit receptor activity by interacting with the binding site recognized by the endogenous ligand, the so-called “orthosteric” binding site. Consequently, most clinically used GPCR ligands represent either orthosteric agonists (agents that mimic the action of the endogenous GPCR ligands), neutral antagonists, or inverse agonists. However, a considerable body of work suggests that GPCRs, like many other signaling molecules or enzymes, are endowed with one or more additional, so-called “allosteric” sites that are recognized by allosteric ligands or modulators (Christopoulos, 2002; Christopoulos and Kenakin, 2002; Birdsall and Lazareno, 2005; Gao and Jacobson, 2005). By definition, these allosteric binding sites are distinct from the sites involved in the binding of orthosteric ligands, allowing allosteric and orthosteric agents to bind to their target receptors simultaneously (Christopoulos, 2002; Christopoulos and Kenakin, 2002; Birdsall and Lazareno, 2005). Various radioligand binding and functional approaches have been used to characterize the binding and functional properties of allosteric GPCR ligands (for recent reviews, see Christopoulos, 2002; Christopoulos and Kenakin, 2002; Mohr et al., 2003; Birdsall and Lazareno, 2005; Ehlert, 2005). The binding of allosteric modulators is predicted to cause conformational changes in the receptor protein that can have different functional consequences. One important outcome is that the binding of the allosteric agent increases or reduces the affinity of the endogenous ligand for the orthosteric site (such allosteric agents are also referred to as allosteric enhancers or inhibitors, respectively) and/or for exogenously applied orthosteric ligands. During the past decade, considerable efforts have been focused on developing novel therapeutic agents that target allosteric GPCR binding sites. Research in this area has been driven primarily by considerations that such drugs are potentially more efficacious and less toxic than classic orthosteric GPCR ligands. Some of the major advantages associated with the potential therapeutic use of allosteric GPCR ligands are listed in Table 1 (for a detailed discussion, see Christopoulos, 2002; Christopoulos and Kenakin, 2002; Birdsall and Lazareno, 2005). Various members of each of the three major GPCR subfamilies (A, B, and C) have been shown to be subject to allosteric modulation by small molecule ligands (Christopoulos, 2002; Christopoulos and Kenakin, 2002; Gao and Jacobson, 2005; Presland, 2005). During the past 3 decades, the muscarinic acetylcholine (ACh) receptors (mAChRs) have served as an excellent model system to study the molecular mechanisms by which GPCR activity can be modulated by allosteric drugs (Ellis, 1997; Christopoulos, 2002; Mohr et al., 2003; Birdsall and Lazareno, 2005). The five mAChRs (M1-M5), like most other GPCRs, are prototypic class A (rhodopsin-like) GPCRs (Wess, 1996; Caulfield and Birdsall, 1998; Hulme et al., 2003). All five mAChR subtypes have been shown to be subject to allosteric modulation. However, the molecular nature of this modulation differs among the individual receptor subtypes and depends on the choice of orthosteric and allosteric ligands and their concentrations (Ellis, 1997; Christopoulos, 2002; Mohr et al., 2003; Birdsall and Lazareno, 2005). The amino acids forming the binding site for orthosteric muscarinic ligands are located within the exofacial portions of various transmembrane (TM) helices, primarily TM domains III, V, VI, and VII (Wess, 1996; Hulme et al., 2003). The receptor binding site for allosteric muscarinic ligands is thought to be located near the orthosteric site but at a more extracellular level, involving residues located in the extracellular loops and the outermost segments of different TM helices (Matsui et al., 1995; Ellis, 1997; Christopoulos, 2002; Mohr et al., 2003; Birdsall and Lazareno, 2005). Drugs that can stimulate or inhibit the activity of individual mAChR subtypes with high selectivity may become therapeutically useful in the treatment of many pathophysiological conditions including Alzheimer's and Parkinson's disease, schizophrenia, and drug abuse (Felder et al., 2000; Wess, 2004; Eglen, 2005). However, the amino acids involved in ACh binding are highly conserved among the M1-M5 mAChRs (Wess, 1996; Caulfield and Birdsall, 1998; Hulme et al., 2003), most likely because of evolutionary pressures. For this reason, orthosteric muscarinic ligands that can interact with distinct mAChR subtypes with a very high degree of selectivity are not available at present. On the other hand, the extracellular surface of the M1-M5 mAChRs, including the three extracellular loops, is less well conserved than the TM receptor core containing the binding site for orthosteric ligands (Wess, 1996; Ellis, 1997; Caulfield and Birdsall, 1998). Because the allosteric muscarinic binding site is predicted to involve receptor epitopes located extracellular of the ACh binding site, it is likely that these sequence differences can be exploited to develop receptor subtype-selective allosteric muscarinic ligands. Consistent with this concept, it has been reported that thiochrome, a thiamine metabolite, selectively enhances the affinity of ACh for the M4 receptor subtype without affecting ACh binding or function at the other subtypes (Lazareno et al., 2004). Moreover, several snake toxins have been identified that display an unprecedented degree of mAChR subtype selectivity (Karlsson et al., 2000; Potter, 2001). For example, MT7 (m1-toxin1) and MT3 (m4-toxin) are highly selective antagonists at M1 and M4 mAChRs, respectively (Karlsson et al., 2000; Potter, 2001). The binding of these polypeptide ligands seems to involve interactions with less well conserved amino acids present on the extracellular surface of the mAChRs (Potter, 2001). The vast majority of known allosteric muscarinic ligands have no significant effect on receptor function in the absence of orthosteric ligands (agonists). However, two agents have been described recently, AC-42 (Spalding et al., 2002) and the clozapine metabolite N-desmethylclozapine (Sur et al., 2003), that can activate M1 mAChRs with a considerable degree of selectivity. Studies with mutant M1 mAChRs and M1/M5 hybrid receptors suggested that the M1 receptor residues involved in the binding of these agents may be different, at least partially, from those critical for the binding of ACh and other orthosteric muscarinic agonists (Spalding et al., 2002; Sur et al., 2003). It is noteworthy that accumulating evidence suggests that mAChRs may be endowed with at least two allosteric binding sites (Christopoulos, 2002; Mohr et al., 2003; Birdsall and Lazareno, 2005). One key observation supporting this concept is that certain indolocarbazole (Lazareno et al., 2000) and androstane (Lazareno et al., 2002) derivatives are predicted to bind to a nonorthosteric site different from that recognized by other allosteric muscarinic ligands such as gallamine or strychnine. Moreover, several allosteric muscarinic ligands, including the acetylcholinesterase inhibitor tacrine (Potter et al., 1989) and the bis-pyridinium derivative Duo3 (Tränkle and Mohr, 1997; Schröter et al., 2000), have been identified that, in contrast to conventional allosteric muscarinic ligands, display concentration-effect curves with slope factors >1. The complex binding properties of Duo3 suggested that this ligand, similar to the above-mentioned indolocarbazole and androstane derivatives, may interact with a second allosteric binding site (Tränkle and Mohr, 1997; Schröter et al., 2000; Tränkle et al., 2003). In this issue, Tränkle et al. (2005) present new findings regarding the existence of a second allosteric site on the M2 mAChR and provide data suggesting that two molecules of an allosteric agent and one orthosteric ligand may be able to bind to the M2 mAChR simultaneously (Fig. 1). The authors based their conclusions on analysis of the interactions of tacrine and Duo3 with several other allosteric muscarinic agents predicted to bind to the “common” allosteric binding site. Studies with M2/M5 hybrid receptors and mutant M2 receptors indicated that the M2 receptor epitopes involved in the binding of tacrine and Duo3 may not be identical, adding an extra layer of complexity. Molecular modeling and ligand docking studies suggested that two allosteric agents may be able to bind to neighboring areas of the allosteric binding cleft simultaneously. This cleft is predicted to be formed by the receptor's extracellular loops near the entrance of the orthosteric binding site (Voigtländer et al., 2003) (Fig. 1). Thus, unless the analyzed allosteric agents exceed a certain critical size, cooperative interactions may occur between two allosteric molecules within the allosteric binding cleft. The binding of muscarinic ligands to these allosteric subdomains is predicted to be governed by different structure-function relationships (Mohr et al., 2003; Birdsall and Lazareno, 2005). This observation should guide medicinal chemists in designing novel allosteric drugs acting at distinct mAChR or other GPCR subtypes. In is noteworthy that the FDA has recently approved the first allosteric GPCR ligand, cinacalcet (an allosteric enhancer acting on the calcium-sensing receptor), for the treatment of certain forms of secondary hyperparathyroidism and hypercalcemia (Block et al., 2004; Lindberg et al., 2005). Model of the M2 mAChR (side view) showing the simultaneous binding of an orthosteric ligand (NMS) and two molecules of an allosteric muscarinic agent (tacrine). In this figure (kindly provided by Dr. Hans-Dieter Höltje), the muscarinic antagonist NMS (white structure) has been docked to the orthosteric binding site located within the TM receptor core. The study by Tränkle et al. (2005) suggests that two different allosteric agents (or two molecules of the same allosteric agent) can simultaneously bind to different subdomains within the receptor's allosteric binding cleft. The amino acids predicted to be involved in the binding of allosteric muscarinic ligands are thought to be located within the extracellular loops and the outermost segments of different TM helices (Matsui et al., 1995; Ellis, 1997; Christopoulos, 2002; Mohr et al., 2003; Birdsall and Lazareno, 2005). In this model, two molecules of tacrine (yellow and green structures) are bound simultaneously within the allosteric binding cleft. Use of colors and abbreviations: TM helices (I-VII), red; N-terminal domain (N) and first (o1) and third (o3) extracellular loops, gray; second extracellular loop (o2), cyan; cysteine residues involved in disulfide bond formation, magenta. Primarily because of the experimental designs used, past drug discovery efforts have yielded a large number of clinically important drugs acting on the orthosteric site of GPCRs. It is likely that the application of new methodologies, including high-throughput functional screening techniques, will lead to the identification of many novel allosteric GPCR ligands (Christopoulos, 2002; Presland, 2005). Such agents are of considerable therapeutic potential because their use is predicted to be associated with increased efficacy and reduced side effects compared with classic orthosteric ligands (Table 1). Please see the related article on page 1597. ABBREVIATIONS: GPCR, G protein-coupled receptor; ACh, acetylcholine; MAChR, muscarinic acetylcholine receptor; TM, transmembrane; AC-42, 4-n-butyl-1-[4-(2-methylphenyl)-4-oxo-1-butyl]-piperidine hydrogen chloride; Duo3, 4,4′-bis-[(2,6-dichloro-benzyloxy-imino)-methyl]-1,1′-propane-1,3-diyl-bis-pyridinium dibromide. Birdsall NJM and Lazareno S (2005) Allosterism at muscarinic receptors: ligands and mechanisms. Mini Rev Med Chem 5: 523-543. Block GA, Martin KJ, de Francisco AL, Turner SA, Avram MM, Suranyi MG, Hercz G, Cunningham J, Abu-Alfa AK, Messa P, et al. (2004) Cinacalcet for secondary hyperparathyroidism in patients receiving hemodialysis. N Engl J Med 350: 1516-1525. Caulfield MP and Birdsall NJM (1998) International Union of Pharmacology. XVII. Classification of muscarinic acetylcholine receptors. Pharmacol Rev 50: 279-290. Christopoulos A (2002) Allosteric binding sites on cell-surface receptors: novel targets for drug discovery. Nat Rev Drug Discov 1: 198-210. Christopoulos A and Kenakin T (2002) G protein-coupled receptor allosterism and complexing. Pharmacol Rev 54: 323-374. Eglen RM (2005) Muscarinic receptor subtype pharmacology and physiology. Prog Med Chem 43: 105-136. Ehlert FJ (2005) Analysis of allosterism in functional assays. J Pharmacol Exp Ther 315: 740-754. Ellis J (1997) Allosteric binding sites on muscarinic receptors. Drug Dev Res 40: 193-204. Felder CC, Bymaster FP, Ward J, and DeLapp N (2000) Therapeutic opportunities for muscarinic receptors in the central nervous system. J Med Chem 43: 4333-4353. Fredriksson R, Lagerström MC, Lundin LG, and Schiöth HB (2003) The G-protein-coupled receptors in the human genome form five main families. Phylogenetic analysis, paralogon groups and fingerprints. Mol Pharmacol 63: 1256-1272. Gao ZG and Jacobson KA (2005) Allosterism in membrane receptors. Drug Discov Today, in press. Hulme EC, Lu ZL, and Bee MS (2003) Scanning mutagenesis studies of the M1 muscarinic acetylcholine receptor. Recept Channels 9: 215-228. Karlsson E, Jolkkonen M, Mulugeta E, Onali P, and Adem A (2000) Snake toxins with high selectivity for subtypes of muscarinic acetylcholine receptors. Biochimie 82: 793-806. Lazareno S, Dolezal V, Popham A, and Birdsall NJM (2004) Thiochrome enhances acetylcholine affinity at muscarinic M4 receptors: receptor subtype selectivity via cooperativity rather than affinity. Mol Pharmacol 65: 257-266. Lazareno S, Popham A, and Birdsall NJM (2000) Allosteric interactions of staurosporine and other indolocarbazoles with N-[methyl-3H]scopolamine and acetylcholine at muscarinic receptor subtypes: identification of a second allosteric site. Mol Pharmacol 58: 194-207. 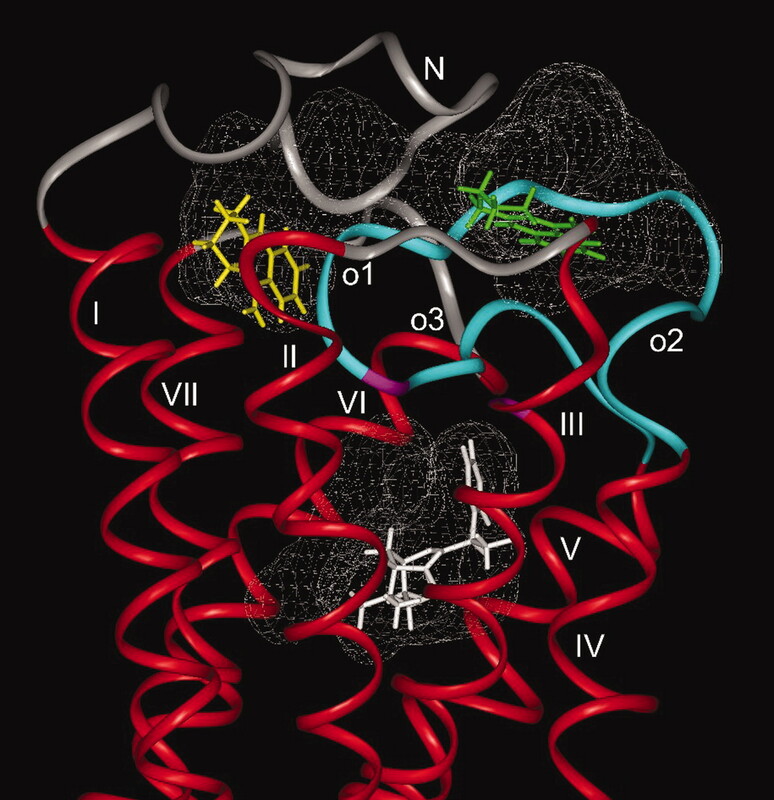 Lazareno S, Popham A, and Birdsall NJM (2002) Analogs of WIN 62,577 define a second allosteric site on muscarinic receptors. Mol Pharmacol 62: 1492-1505. Lindberg JS, Culleton B, Wong G, Borah MF, Clark RV, Shapiro WB, Roger SD, Husserl FE, Klassen PS, Guo MD, et al. (2005) Cinacalcet HCl, an oral calcimimetic agent for the treatment of secondary hyperparathyroidism in hemodialysis and peritoneal dialysis: a randomized, double-blind, multicenter study. J Am Soc Nephrol 16: 800-807. Matsui H, Lazareno S, and Birdsall NJM (1995) Probing of the location of the allosteric site on M1 muscarinic receptors by site-directed mutagenesis. Mol Pharmacol 47: 88-98. Mohr K, Tränkle C, and Holzgrabe U (2003) Structure/activity relationships of M2 muscarinic allosteric modulators. Recept Channels 9: 229-240. Potter LT (2001) Snake toxins that bind specifically to individual subtypes of muscarinic receptors. Life Sci 68: 2541-2547. Potter LT, Ferrendelli CA, Hanchett HE, Hollifield MA, and Lorenzi MV (1989) Tetrahydroaminoacridine and other allosteric antagonists of hippocampal M1 muscarinic receptors. Mol Pharmacol 35: 652-660. Presland J (2005) Identifying novel modulators of G protein-coupled receptors via interaction at allosteric sites. Curr Opin Drug Discov Dev 8: 567-576. Schröter A, Tränkle C, and Mohr K (2000) Modes of allosteric interactions with free and [3H]N-methylscopolamine-occupied muscarinic M2 receptors as deduced from buffer-dependent potency shifts. Naunyn-Schmiedeberg's Arch Pharmacol 362: 512-519. Spalding TA, Trotter C, Skjaerbaek N, Messier TL, Currier EA, Burstein ES, Li D, Hacksell U, and Brann MR (2002) Discovery of an ectopic activation site on the M1 muscarinic receptor. Mol Pharmacol 61: 1297-1302. Sur C, Mallorga PJ, Wittmann M, Jacobson MA, Pascarella D, Williams JB, Brandish PE, Pettibone DJ, Scolnick EM, and Conn PJ (2003) N-Desmethylclozapine, an allosteric agonist at muscarinic 1 receptor, potentiates N-methyl-d-aspartate receptor activity. Proc Natl Acad Sci USA 100: 13674-13679. Takeda S, Kadowaki S, Haga T, Takaesu H, and Mitaku S (2002) Identification of G protein-coupled receptor genes from the human genome sequence. FEBS Lett 520: 97-101. Tränkle C, Dittmann A, Schulz U, Weyand O, Buller S, Jöhren K, Heller E, Birdsall NJM, Holzgrabe U, Ellis J, et al. (2005) Atypical muscarinic allosteric modulation: cooperativity between modulators and their atypical binding topology in muscarinic M2 and M2/M5 chimeric receptors. Mol Pharmacol 68: 1597-1610. Tränkle C and Mohr K (1997) Divergent modes of action among cationic allosteric modulators of muscarinic M2 receptors. Mol Pharmacol 51: 674-682. Tränkle C, Weyand O, Voigtländer U, Mynett A, Lazareno S, Birdsall NJM, and Mohr K (2003) Interactions of orthosteric and allosteric ligands with [3H]dimethyl-W84 at the common allosteric site of muscarinic M2 receptors. Mol Pharmacol 64: 180-190. Voigtländer U, Jöhren K, Mohr M, Raasch A, Tränkle C, Buller S, Ellis J, Höltje H-D, and Mohr K (2003) Allosteric Site on muscarinic acetylcholine receptors: identification of two amino acids in the muscarinic M2 receptor that account entirely for the M2/M5 subtype selectivities of some structurally diverse allosteric ligands in N-methylscopolamine-occupied receptors. Mol Pharmacol 64: 21-31. Wess J (1996) Molecular biology of muscarinic acetylcholine receptors. Crit Rev Neurobiol 10: 69-99. Wess J (2004) Muscarinic acetylcholine receptor knockout mice: novel phenotypes and clinical implications. Annu Rev Pharmacol Toxicol 44: 423-450.